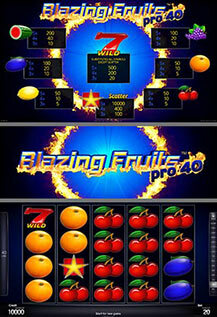 This pro40 version of the Blazing Fruits™ concept will amaze you with the exciting design and sound. With the 40-line (fixed) and 5-reel video game the scale of fruit games reached a new dimension. All wins are for combinations of a kind and are paid for combinations left to right on lines (fixed), except scatter STAR. SCATTER symbols pay at any position. Highest win only paid per selected line. SCATTER wins are added to line wins. The WILD 7 symbol substitutes all other symbols except SCATTER. Reels can be started and stopped by pressing on the corresponding reels area on the touchscreen.